We are tagged as the one of the leading manufacturer and exporter of industrial workstation. We offer industrial workstation made from high grade material. We precisely built this workstation, which comfortably provides level best facilities to assemblies of different products, and ideally works as the line of production. It is ideally maintain the process flow and support automation. This sturdy constructed work station supports many industrial operations. 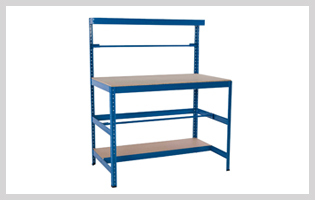 Highly durable workstations are efficiently works in all kind of environment. They are made by our special space saving technique. They are equipped with monitor stands, adjustable footrests, document holder and adjustable shelves. It is also used for the testing and handling of the material. It is also convenient for the standing and sitting arrangement of the operator. Convenient design of workstation supports the elbows, forearms and wrist of the operator. Rounded safety edges help operator to move easy. We own the highly developed manufacturing facilities. With the help of these ultramodern production set-ups, we provide all kinds of customized solutions regarding workstation tops, vices, perforation panels, cladding options, drawers. With deep knowledge of various industrial operations, we provide workstations with maximum working space considering latest ergonomics. Industrial workstation tops are a stable working surface contains effectual protection against water, dirt, oil and grease.